First you will come to a login page with Microsoft's logo. Type in your username@uit.no. Click Next. Next you will come to a login page with UiT's logo. Type in your UiT password. Click Sign in. Click "+New" to start to write a new email. These are your foloders. You can see all your folders if you click More. Email in the folder chosen in step 2. Preview pane. Shows the email chosen in step 3. 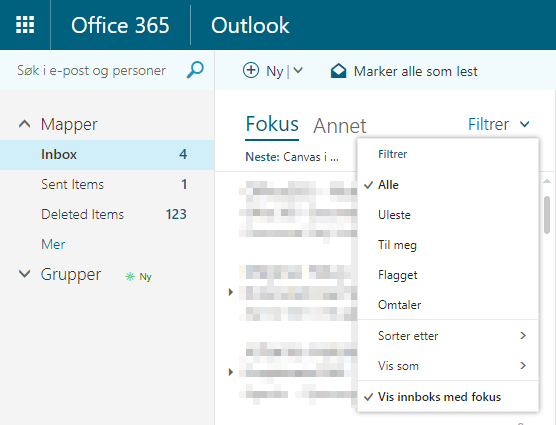 Outlook services. 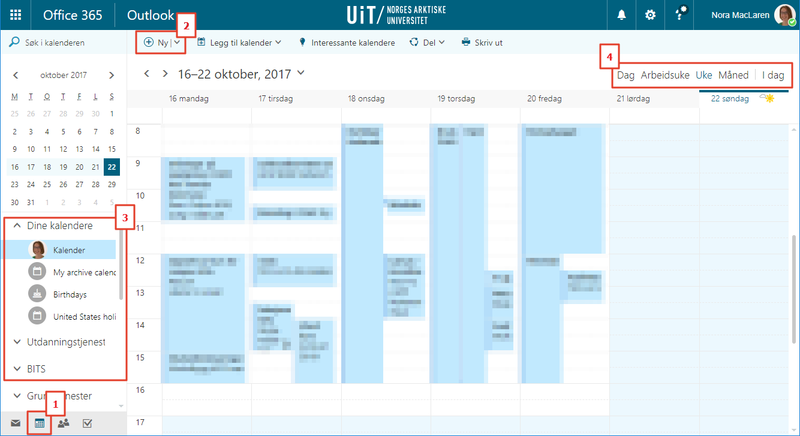 Switch between Email, Calender, People (address book) and Tasks. Click "+New" up to the left to start writing a new email. 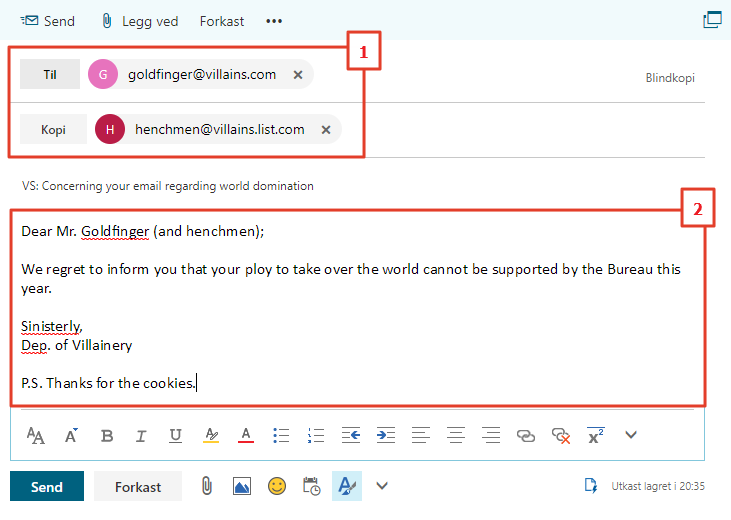 Add email addresses in "To" and "Copy". You can search UiT's directory by typing a name. The main body of the email starts below. 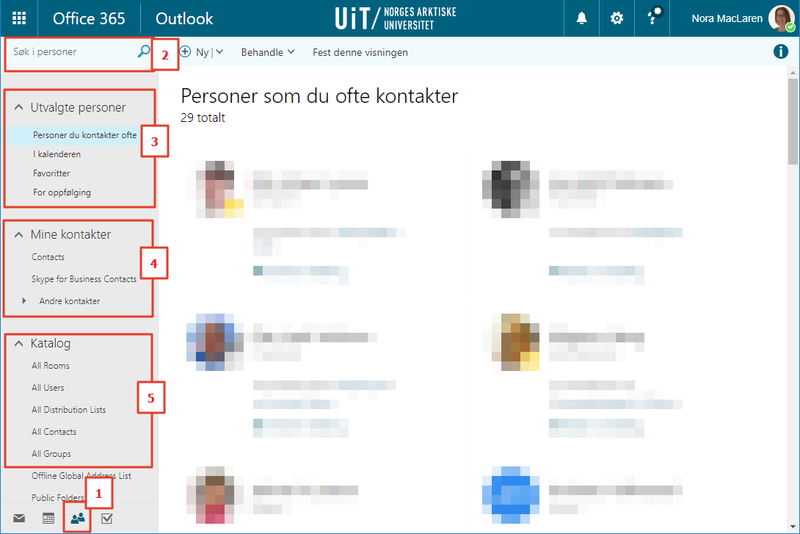 You can sort your email by Focus, Other and Filter. If you click on Filter you can e.g. find emails that were sent directly to you (rather than going via an email list). Open your calendar by clicking the calender icon in the bottom left-hand corner. Click "+New" to create a new meeting. This is where you find your calenders and others you have added. Change the view to day, work week, week or month. In your address book you will find all employees and students at UiT as well as meeting rooms. Open People by clicking the People icon in the bottom left-hand corner. Search in your contacts and UiT's directory. People you contact often, people you have meetings with today, and more. My contacts are people you have added to your address book. Catalog is another way to access UiT's directory, including email lists and meeting rooms.